Cai Guo-Qiang: There and Back Again"is a solo exhibition by the New York based Chinese born contemporary artist. It is the first large-scale solo exhibition of the artist to be held in Japan in the last seven years. 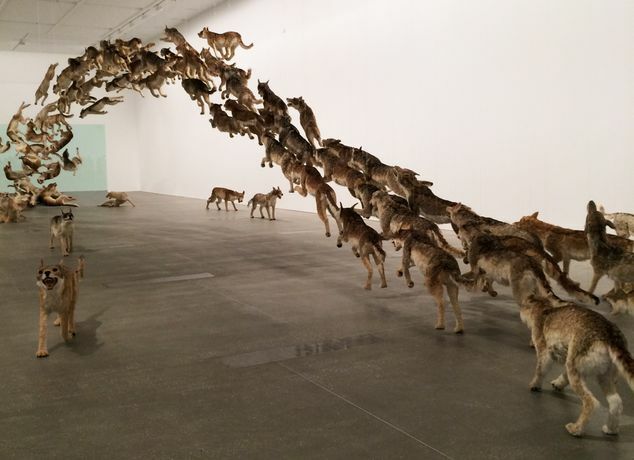 After studying stage design at the Shanghai Theater Academy, Cai Guo-Qiang lived in Japan for nearly nine years, from 1986 to 1995. In Japan, he began exhibiting at art museums and participating in exhibitions abroad, which brought him international recognition. Since 1995, he has lived in New York City and has participated in major solo and group exhibitions around the world. Cai is known for his gunpowder drawings, his grand scale installations and ephemeral events using fireworks and other media. By applying unconventional materials and dynamic techniques, he incorporates various elements of Chinese culture such as gunpowder and Chinese traditional medicine—he grounds his artwork and practice in an Eastern worldview. This exhibition presents significant works produced in the recent years, which have never been shown in Japan. As an artist who was born in China, studied in Japan, and currently lives and works in America, Cai’s work reveals a unique consideration and harmony between Eastern and Western philosophy. This exhibition features new large-scale two-dimensional works—commissioned especially for this exhibition. The new drawings will be created in Cai’s signature medium, igniting gunpowder on Japanese paper. The subject will be selected through the artist’s research on the history and culture of the city of Yokohama. The exhibition also includes "Head On," of Cai’s signature works, which will be shown for the first time in Japan. Taking inspiration from the title of Tao Yuanming’s famous poem“The Return,” this solo exhibition intends a return to the place of origin where Cai’s artistic path first took shape. It also aims to introduce his current practice, including a new work based on the history of Yokohama. This will be a monumental solo exhibition in which Cai Guo-Qiang returns to a place that was instrumental in shaping the formative years of his career.